A few decades ago, it was quite common in South India to use coconut fiber / coir as a scrub to clean the vessels. Since coconut is the staple diet in most households in South India, coconut coir is available in plenty. After 3-4 days this old coir scrub was discarded and a new one used in its place. After all, there was no dearth of coconut fibre. But with time, the humble coir scrub became uncool and most women started using store bought kitchen sponges. 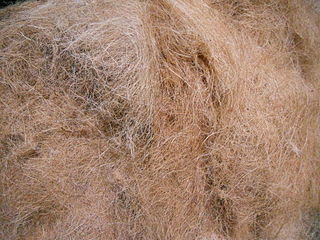 Waste coconut fiber / coir can be used as kitchen scrub. Kitchen sponge is more dirtier than a toilet seat. Now this kitchen sponge is one of the dirtiest thing that can be found in our homes. It harbors zillions of microbes, that cause pneumonia and meningitis, according to a new study. After analyzing DNA samples from 14 different used kitchen sponges, researchers based in Germany discovered the dominance of a class of bacteria called Gammaproteobacteria - which include a number of human pathogens including bacteria that cause typhoid fever, the plague, cholera and food poisoning. Kitchen sponges, due to their porous nature and water-soaking capacity provide the ideal environment for microorganisms. The researchers discovered that a sugar-cube sized piece of bacteria in the most bacteria dense part of the sponge contained 54 billion bacterial cells. Earlier studies had showed that by microwaving wet sponges or boiling them in water for a few hours could sanitize these sponges by reducing the microbial count to at considerable extent. A 2009 study showed that the microwave and the dishwasher were both effective ways to clean domestic sponges. However the recent German study found that sponges that had been regularly sanitized teemed with a higher percentage of bacteria related to pathogens than sponges that had never been cleaned. This could be because pathogen-related bacteria are more resistant to cleaning and rapidly recolonize the areas abandoned by their susceptible brethren—similar to what happens to our gut after an antibiotic treatment, the scientists say. While the researchers say that they need to conduct further experiments to confirm their findings, their data allow for speculation that the prolonged used of sanitation measures to try and clean kitchen sponges is not advisable. 'We therefore rather suggest a regular (and easily affordable) replacement of kitchen sponges, for example, on a weekly basis,' the researchers concluded. Replace your kitchen sponge every week. So, if you are using a kitchen sponge, don't microwave it or dip it in dettol solution or soak it in boiling water to sanitize it. Just use it for a week and discard it. Don't be thrifty as far as your health is concerned. A kitchen sponge costs less than 10 bucks and it's not a big deal replacing it, considering the amount of illnesses it can spread. Better still switch to using waste coconut fibre as kitchen scrubs. It's a different matter that coconut coir scrubs are also available online and they are quite expensive too. In conclusion, it's not wise to embrace every fad in the name of modernity. The age-old method of using waste coconut coirs as scrubs for washing vessels was and is the most hygienic way to clean. So if you do have lots of coconut coir lying around, ditch that kitchen sponge and use it instead. the study shows that cleaning a sponge doesn't help with all bacteria, changing our sponges every week, adding that it’s an easily affordable option for staying hygienic. Kitchen sponges are known to host “risk group 2” bacteria, which cause diseases that, although preventable, would be something anyone would want to avoid. Despite the facts, a toilet seat is quite clean, compared to a kitchen sponge or even your iPhone(who cleans the phone). Why to microwave a sponge when you can just throw it away and replace it with a new one?